As you know from my previous updates, the work of the Wenatchee-based Wildfire Project and its well-regarded “Era of Megafires” presentation inspired my forest health legislation passed in 2017. In addition to approving Senate Bill 5546, the Legislature also appropriated funding to the Wildfire Project in continued support of its important education efforts. To date, the “Era of Megafires” has reached over 26,000 people in seven Western states and Canada. Last Friday, I had the honor of introducing the presentation to 500 Wenatchee School District students who filled the downtown Performing Arts Center. The Wildfire Project had partnered with the “Every Kid at the PAC” program to help educate our local students. It was another great example of how the Wildfire Project continues to provide our community with helpful information on this important issue. 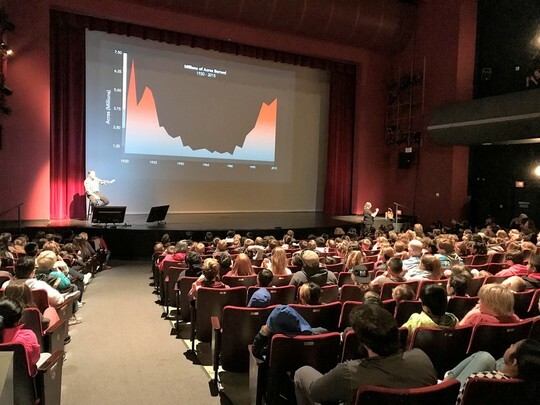 The Wildfire Project’s Dr. Paul Hessburg discusses historical burn data with over 500 Wenatchee School District students and staff Friday at the Performing Arts Center. Similar to my budget appropriation last year for the Wildfire Project’s educational work, I was able to secure additional funding this year in response to a request from the Forest Ridge Wildfire Coalition. This non-profit group, which has done an outstanding job of implementing FireWise principles, approached me this past summer seeking help to reduce wildfire risks posed by a section of Squilchuck State Park. 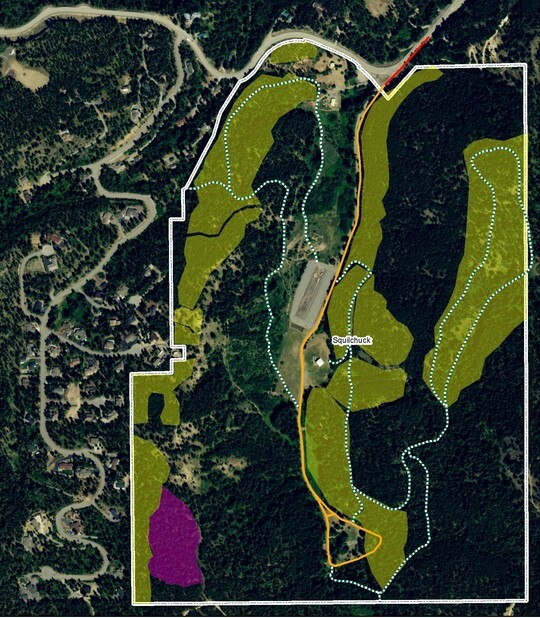 The wildfire coalition has been working closely with the State Parks and Recreation Commission to improve forest health in the park, which is adjacent to the Forest Ridge community of approximately 120 homes. While important work has been completed in much of the park, thanks to the leadership from our State Parks department, one remaining portion (approximately 20 acres near the southwest corner) poses a particular challenge and has yet to be treated. This portion of the park will continue to be a problem area and jeopardize adjacent land if it goes untreated. That work involves more than the State Parks budget could support, so the Forest Ridge coalition, led by chairman Jerry Holm, reached out to me several months before the 2018 session. My office developed and submitted a budget request for $100,000 to fund the treatment of the remaining 20 acres. We were very pleased that the Legislature agreed to fund my request. This is a win for one of our local state parks and it is a continuation of the awesome work being done by the Forest Ridge Wildlife Coalition. I am very pleased to see the cooperative working relationship its members have developed with State Parks and its staff. In broader terms, the $100,000 funding included in the 2018 supplemental budget is another positive product of our community’s ongoing conversation and work on wildfire. It just goes to show, similar to the work of the Wildfire Project, what can be accomplished when people work together, share ideas, and find creative solutions to resolving issues. I am very proud to have been a part of assisting State Parks and the Forest Ridge Wildfire Coalition on this important issue. As we approach summer and our expanding wildfire season, please review these Department of Natural Resources recommendations about wildfire prevention. Squilchuck State Park (inside the white line) is adjacent to homes in the Forest Ridge community. The yellow areas inside the park have received forest thinning treatments. My budget funding will resolve the remaining concerns regarding the purple portion, which covers approximately 20 acres.